Turbo trainers get a pretty bad rap – for every rider you can find that enjoys using them you’ll probably find 30 more that say they hate it. But, we’re going to get controversial and propose that, if you’re one of the latter, then you’re either just a sheep, following the consensus of opinion, or you’re plain and simply not doing it right. Too many times we’ve heard “it’s boring” as an excuse, only to dig a little deeper and discover that actually, the rider has never given it a fair crack of the whip, going on a few experiences from many years ago, or worse, in some cases, having never tried at all. Of course, aimlessly pedalling for an hour, staring at the wall is the epitome of tedium, and indoor trainers will never be able to replace the whole experience of riding on the roads, but turbo training is what you make of it. With a well structured and varied session, you’ll find time flying by and what’s more you’ll get potentially much bigger fitness rewards. So, if you and your turbo are not getting along, we’re here to offer some relationship counselling. Variety is the spice of life and if you apply this principle to your training and your turbo you could have a match made in heaven. T here are a great many indoor trainers on the market, so it’s important to understand the differences and be clear about what you want from one, plus how you wish to use it. That way you’ll be sure to buy the most suitable product and get the most out of owning one. We help you get to the bottom of that here, and inspire you with choices currently available that will wet your appetite for some turbo time, and have you rushing to the shed. In the weeks to follow, we will also suggest a variety of sessions to keep you motivated, and reaping the rewards. Clearly there are several long-held arguments for indoor training. The weather is of course the first, but the quality vs quantity argument is a strong second. Rather than spending hours on the open road with only a portion of that time actually spent at the goal intensity, condense the same session into a more focussed, shorter time frame indoors. In spite of this, boredom is a barrier hard to overcome for many, so understanding what floats your boat is key to helping you stay interested when your training moves indoors. Knowing your psychology and personality, as well as what style of session suits you, could influence your choice of trainer or ‘turbo type’ and make for a better working partnership. You’re motivated by improving your performance and are prepared to go the extra mile for fitness gains, particularly speed and power. You worry that time off the bike leads to decreased fitness. What’s your excuse for not using a turbo? There’s nothing like actually riding on the road. A trainer with a highly realistic ride feel, with the capacity for heavier loading for interval training and the possibility of data capture. For many serious cyclists, there’s no substitute for actually riding on the road, and that remains as the primary reason for not wishing to train on a turbo. If this is you, you probably already own an indoor trainer – dusty, in a corner somewhere, it having barely seen the light of day since you felt inspired to buy it. But don’t let that stop you from shopping for a new toy. Remember it’s all about getting bang for your buck. It sounds clichéd but it’s the truth. Chances are if you are already serious about your training you currently own a power meter and/or heart rate monitor, which is great, because it means your outlay for a turbo can be substantially less, as it doesn’t need to have built in data. Several innovative designs now on the market, have tackled the ‘feel factor’ and offer a very realistic ride feel, even with the possibility of riding out of the saddle. Kurt Kinetic’s Rock and Roll trainer is an excellent example. Fluid damped resistance and a large flywheel provide a smooth and road-like ride feel, but the unique feature is the ability to be able to unlock it and ride freely out of the saddle, with natural side to side motion. This allows you to replicate outdoor hill and sprint efforts more closely, bringing core muscles and lower back strength into play, as well as offering natural saddle breaks. The latest generation of fluid damped trainers, such as this one, also make it possible for high power outputs, with inertial resistance, i.e. the harder you pedal the more resistance is applied. The result is a wide variety of different workouts can be played out, so you should never feel stuck in the ‘old’ turbo rut. Rollers are another alternative to turbo training, bringing many positive benefits in terms of pedalling efficiency, balance and skill. Elite has taken things a step further with its ‘e-motion’ rollers by adding fore and aft movement of the rollers to facilitate out of the saddle riding. It adds another dimension of skill and concentration, plus opens the door for more varied and realistic workouts, whilst still retaining the fundamental benefit of roller riding in terms of forcing you to pedal smoothly, in circles. Great for developing a more efficient pedalling style, which will help conserve energy in races. The Racer: Roland Tilley is a hardened 1st Cat roadman, with over 30 years experience. What motivates you to train on a turbo? “You get much better value for your time. No time gets wasted. Before, you don’t need to spend ages getting all dressed up to go out in the cold, during you don’t waste time soft pedalling or freewheeling, and after there’s no bike to clean and sort out, you just get straight in the shower – job done. Plus it doesn’t always have to be about torture to do you any good. There’s plenty of benefit to riding varied stuff that’s not all high end too. You’re building fitness based around one or two big events or challenges a year, where distance and endurance are important. You’re enthusiastic about training regularly and have specific areas you want to improve on. In built measurement and coaching assistance, possibly with Virtual Reality capabilities too. Training gadgets are booming. Where racers may have invested in a Power Tap wheel to gather ‘real time’ data from races and training rides, the sportiver may want to look at broader options for gathering training information. A key is getting data that is more specific to the type of efforts that sportive events demand, such as simulating long, Alpine climbs. Virtual reality software has revolutionised the possibilities in this regard. You can ride Alpe D’Huez or the Stelvio Pass, or even ride the Paris Roubaix from the comfort of your own living room. Tacx is a brand leading the virtual reality market, with its Fortius and i-Magic trainers. There’s even a multiplayer option that enables on-line racing against real opponents, (which can be your mates, or someone on the other side of the world) bringing the maximum realism and a fun element, to your training. If you are the sort of rider who is mostly driven by the need to compete then this new media could be the answer to putting many more hours in the saddle than you might otherwise do. Virtual reality is not just a gimmick, in most cases it’s carefully calibrated to make it possible for you to cover the classic climbs and measure performances as closely as possible to the real thing. This makes it a motivating tool if you have a specific goal in mind, like preparing for a specific climb during the Etapé, for instance, but also staves off any chance or boredom by giving you something to look at as you go along. In the case of some of the more advanced systems, it’s even possible to connect the bike to a steering console, so that you’ll have to take care of the cornering too. At the same time as being some of the most fun ways to pass the time on a turbo, the majority of virtual reality software also provides plenty of training data. Power output, cadence, heart rate, speed and many other parameters are logged, so you can still keep accurate records of your fitness progression. Another way to get accurate training data at home, that still offers the possibility to compete on-line, against real opponents, is with a static indoor bike such as the Watt Bike. These high tech machines are a cross-breed of the sports science lab ergometer, and indoor’ ‘spin trainers’. In the case of the Watt Bike it can still be fitted with your own pedals, saddle and handlebars and is fully adjustable to replicate your bike, and will provide heaps of training data. 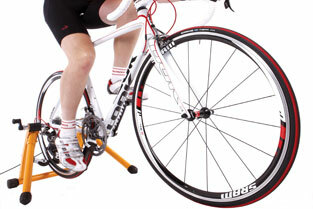 A unique feature of the Watt Bike is the clever ‘Polar View’ of your pedalling, which provides a visual display of the symmetry and efficiency of your technique. If you want a cheaper way to immerse yourself in the world of virtual reality training, as the above mentioned systems are both quite pricey, then there are a host of training DVD’s available. They require you to use your imagination a bit, but if you can let yourself get into the part, so to speak, as they are most often based on a ‘riders eye view’ of a race or specific route, they can still provide a beneficial way to structure a session with visual, on-screen cues to tell you what intensity you should be riding at and when to make your efforts. It’s all new and exciting, so your keen and enjoying the quick fitness progression, but won’t be losing sleep if you miss a few workouts. Not everyone is looking for a high tech gadget for the garage and to be honest not every cyclist needs that. The good news is a basic trainer can still provide a really good riding experience, and plenty of benefits to boot, at a fraction of the cost. They are great for a short work out when you don’t have much time or the weather has kept you indoors for several days. 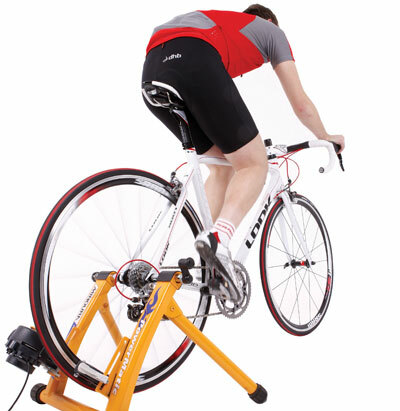 If you are trying to get back into training after a lay off, or have more than one cyclist in the family, a trainer with variable resistance ensures versatility for a wide range of abilities – even the kids can jump on and get acquainted. Magnetic resistance units are versatile, quiet and amongst the cheapest types of turbo. This simple form of varying the resistance allows you to moderate the workouts with ease, starting with light resistance work and building up. In use they are very user friendly, especially as they do not take a huge amount of time to set up befo re you can get on and riding, plus they are often amongst the easiest to tidy away post workout, if you are short on space. Tacx and Minoura are both reputable brands with good products to offer in, but upcoming brands such as Jet Black trainers, offer exceptional value for money and are well worth a look. Some trainers offer upgrades, to attach digital displays for displaying training data, so might be worth considering if you feel that’s a possibility for something you wish to explore further down the line. For some the boredom of turbo training has more to do with its solitary nature than anything else, so if you are a social animal there is no reason why it should not become a group pursuit. Organising for two or three mates to train together can make a dull endurance session more interesting, just by allowing for some conversation and banter. Where space at home won’t allow for training buddies, many clubs or training groups look to hire local village halls, or similar, adding a modern twist to the old school ‘club night’. Don’t forget your fan though, to avoid a sweat fest! Group turbo training has one added advantage over road riding too, as it allows everyone to work at their own level, no one will get dropped so everyone can enjoy a ride together. This article was first published in the January 20 issue of Cycling Weekly. You can also read our magazines on Zinio and download from the Apple store.